Discussion in 'Poicephalus Place' started by lotus15, 7/16/11. Cape Parrots are goofy, sweet, and intelligent, and charm just about everybody with those big ole' beaks of theirs that always look like they're smiling. Their personalities truly match their happy-go-lucky faces: these are wonderful medium-sized parrots that have a zest for playing, swinging, and life! Their wild counterparts are becoming more and more endangered while in captivity, their numbers are just beginning to take off (at least in the US and in Canada). There are many breeding programs in the US dedicated both to rehabilitation in the wild as well as for pets. Although they are still somewhat rare in captivity, they are becoming a more and more popular species for their temperament, intelligence, and personality. Their lifespan is estimated to be between 40-60 years. Cape Parrots belong to the African Poicephalus family of parrots. There is, however, a bit of confusion as to their naming and classification. 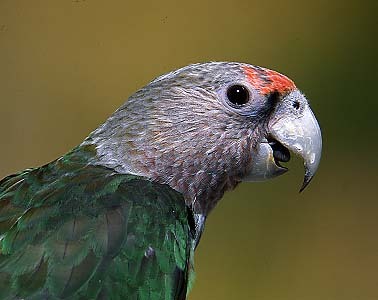 There are two types of Cape Parrots that exist in the US, the grey-headed parrot (Poicephalus fuscicollis suahelicus) and the brown-necked parrot (Poicephalus fuscicollis fuscicollis). These are considered two different subspecies rather than two unique species. There is a third type of Cape Parrot, however, that as far as I can find does not exist in the US, the "true" South African Cape Parrot. It is debated whether or not they are their own species or simply a third subspecies. 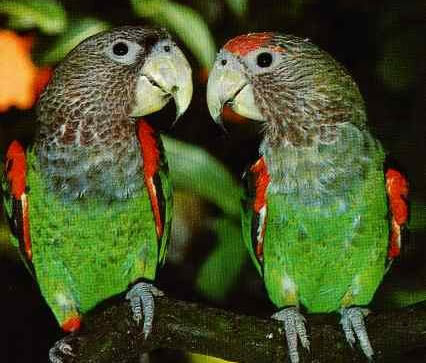 Because they are the only "true" Cape Parrot, Jean Pattison (the "African Queen") began calling the two subspecies available in the US the "UnCape" in order to distinguish them. Generally, however, most people use the terms Cape and UnCape interchangeably. Capes are known for their reputations as "Gentle Giants." They are the only parrot I have ever heard any breeder say that they are incredible gentle and sweet, even when breeding. I know several breeders of many species that say that their Capes are their only breeding birds that will allow them to open up their nestboxes and even handle their eggs without aggression or territoriality. Even wild caught birds seem to adhere to this reputation. That said, male Capes, when sexually mature, do have a reputation for becoming a bit more territorial and aggressive. And of course, any parrot with hormones or reaching sexual maturity will be a parrot. In general, though, it is probably true that Capes are quite a gentle species, especially considering the size of their beaks. Otherwise they are very playful, curious, and often mischievous birds that need plenty of wood to chew and keep themselves busy. Capes love to swing, climb, and hang upside down, whether from perches, swings, cages, or even your hair. They are very good at being independent and playing by themselves or keeping themselves busy, but they also have great snuggle and cuddle potential. I have met a few Capes who are on either end of this spectrum though (total velcro birds, or not snuggly at all). They are generally very sweet and accepting of new people. When frightened or threatened, it seems that most female Capes, at least, would rather fly away than lunge or bite. As a member of the Poicephalus family, they are definitely on the quieter side, although their calls are very high-pitched and they are very chatty. They are similar to a Grey in noise level-- not terribly loud, but always chattering and talking to themselves and therefore somewhat noisy. That said, when in the company of louder birds, they will follow suit. My Cape was never loud until we spent a week at my mother's house with her Hahn's Macaw, who has an awful screaming problem. My Cape found this scream so novel that she picked it up immediately and will occasionally let out a piercing Hahn's scream. Capes are VERY good at quickly picking up noises that they find fun or interesting. They are excellent talkers and some say that their talking ability and intelligence rivals that of the African Grey. I am not necessarily sure that this is true myself, but I do know a number of Capes who are excellent talkers and even speak in context. It seems that the males are more mechanically inclined than females. Capes are sexually dimorphic, with adult males differing from adult females in that they do not keep the coral colored feathers on their heads. Both males and females have coral feathers on the tops of their wings as well as their ankles. Average weights are anywhere from 250-450 grams and generally Capes are comparable in size to Timneh Greys with slightly bigger heads and much bigger beaks. The brown-necked Cape is, generally, on the smaller end (250-325 grams) whereas the grey-headed Cape tends to be larger (325-400 grams). Males also tend to be larger than females. In the wild, Capes feed almost exclusively on the fruit of the yellowwood tree. Due to habitat extinction, however, they also feed on the pecan trees of pecan farmers (who typically shoot them on sight, furthering their endangerment), plums, as well as the deciduous fruits and seeds of other plants. In the wild, most breeders recommend feeding a diet that is a bit higher in nuts than most other parrots (especially walnuts and almonds), a high quality pellet, plenty of fresh sprouts and veggies, as well as cooked foods. Some also say it is better to feed more nuts than seeds. Basically, feed a similar diet to what you would feed any other parrot, only with a slightly higher quantity of nuts. Toys are incredibly important to Capes. Most Capes LOVE to snap small wooden beads, and simply foot toys with strands of beads are enough to keep them busy and entertained for hours on end. Foot toys are a MUST-- a stainless steel bucket full of them is a great idea for Capes. They also tend to love thin slices of soft woods, especially pine wood. My Cape is, apparently, unique in that she also loves very hard woods and natural wood slices, but she is a monster woodchipper so there is that potential. She can go through a fully loaded toy packed with wood parts in a single day. I also know many Capes that love to chew on soft plastics. Strangely, Capes do not seem to be terribly avid shredders. As for size of toys, they can handle relatively large toys because of their formidable beaks, but variety is a good thing. Foraging and manipulative toys are also a great idea for Capes to keep their intelligent minds busy. Finally, swings are a must. Capes are extremely active birds and will do best in the absolute largest cage you can afford. A good minimum cage size, however, is probably 32" by 24" (like the Avian Adventures Mediana). I do know one woman who has a double macaw cage for her Cape and she uses every inch. Cape Parrots have very strong beaks and as such, they can easily chip and peel away at the paint on powder-coated cages. Although it is not a necessity and size is arguably more important than material, it is definitely a good idea to think about investing in a stainless steel cage for these parrots. It is very important to make sure that if you choose to have your Cape Parrot banded, your breeder use a stainless steel band. Cape beaks are so strong that they can (and have been known to) crush aluminum bands. In all, Cape Parrots are sweet, playful, and gentle birds that make excellent pets. They do generally come with a very high price tag, but I challenge you to find a Cape Parrot owner who wouldn't pay every penny and more for his or her Cape(s)! Jiffy, Erin:), Greycloud and 8 others like this. SavageCritter, hedgehogswithwings, sweet francis and 7 others like this. Wow!! Coco, I enjoyed reading this through and through. The first thing that crosses my mind is that potential cape parrot owners better not be cheap when it comes to spending on Toys and toys and toys. "Things that matter most, should not be at the mercy of things that matter least". Saemma- Or the potential owner should be smart and stop up on LOTS and LOTS of wood during Sidewalk Sale..
Is that high-pitched vocalization between the 10-20 second marks in the video a common one? The video however is disturbing to me. Wonderful post Coco! Thank you so much for sharing this with us. Yup... I'd say that Lola's most common natural vocalization. Wow. For some reason that sound really gets to me (in a nails on a chalkboard kind of way). How loud is it in person? Hmm... to be honest... having heard many conures, many macaws, and many loud birds in general, it really isn't very bad at all to me. I find a GCC scream FAR FAR FAR worse than Lola's squeakiness. She definitely has the capability to be pretty loud -- she once saw a hawk and her warning call nearly deafened me because she was on my shoulder -- but she really isn't very loud normally in comparison to other parrots. On average, I'd say she makes less noise than my budgies (they chatter and chirp and yell at each other all day). Her vocalization isn't a scream or a real "call" like other birds... I think of it more as a beep or a squeak. Erin:) and TITANIS like this. I really enjoyed this post. I love all of your information, and you know how much I love Lola and Cape parrots. One day! I'm very glad I found that video because it seems like a lot of people had some misconceptions about Capey noise level! I call Lola "quiet" but it is all relative I guess! How loud is it in person? I guess now I can understand the people who bemoan that Sun Conures are the perfect bird except for the noise (which doesn't bother me at all). I think that Cape vocalization might actually be a deal breaker for me if I fell in love with the species. You would need to see and hear a Cape in person. They're definitely quieter than most parrots from the other major family groups. Much quieter than Aratinga conures, mini macaws, 'tiels and birds of similar size range. They're basically like typical Poicephalus, at least that's what I've experienced and I have seen many Capes over the years. The video does not depict an ordinary situation most people familiar with Capes would see outside a breeder's facility. There are half a dozen Capes housed in a cage used for breeding. It's a highly atypical situation compared to what one would expect in a home and not representative of a flock with single Cape , IMHO. Cape owners can verify if this is the case. That said, the vocalizations of even one bird might not be within your personal tolerance threshold. It depends as much if not more on the individual's tolerance levels as it does on the type and volume of a species' call, I believe. Some people are not bothered by a flock of cockatoos screaming for hours yet another person might find even a mild-mannered conure intolerable. I find my own tolerance to be somewhere in between. The video does not depict an ordinary situation most people familiar with Capes would see outside a breeder's facility. There are half a dozen Capes housed in a cage used for breeding. It's a highly atypical situation compared to what one would expect in a home and not representative of a flock with single Cape , IMHO. Cape owners can verify if this is the case. Lola isn't that loud all the time but I find the video to represent pretty well what her typical vocalizations are like, at least in my experience. She lets out a few of the louder beeps a day in the morning or when she is excited (usually when I come home from work). She's not like that all day long, but if you are interested in owning a Cape, I'd be prepared to hear noises like the ones in the video on a daily basis.